To live up to mankind's challenges, we are in constant need for new molecules. New drugs need to be designed and tested, new materials prepared and this is the challenge faced by the organic chemist. When organic chemists want to synthesise molecules, they will analyse the functional groups present within the target and choose a suitable strategy accordingly. However, for some molecules, identifying a suitable strategy can be very challenging when the distances between the functionalities in the molecule do not match the "natural" polarity of potential precursors. One classical example is that where two carbon-oxygen double bonds (also called "carbonyl" groups) are separated by four carbon atoms. "These so called '1,4-dicarbonyl compounds' are significantly more difficult to make than the corresponding 1,3- or 1,5-analogues, and this is something we teach every student in Organic Chemistry I, already at the 2nd semester of studies, at the University of Vienna", says Nuno Maulide, Professor for Organic Synthesis at the Institute of Organic Chemistry of the University. To make these motifs in the lab, no good strategy exists. "What we teach our students is that a so-called 'Umpolung' of one of the reaction partners is required, but this is no real good solution to the problem", so Maulide. This is a severe problem, especially 1,4-dicarbonyls are found in many natural products, drug targets and several enzyme inhibitors used in pharmaceuticals. Nuno Maulide and his coworkers from Organic Chemistry Department of the University of Vienna have now developed a new synthetic route to these structures using reagents called sulfoxides, an oxidized species of sulfur. "What makes our method so fascinating is that sulfur is decisively involved in the reaction, but it doesn't even appear in the final molecule" explains Immo Klose, DOC-fellow of the Austrian Academy of Sciences and co-first author of the study. "This is also what makes this reaction very intriguing because it is not obvious at first sight how the starting materials form the product", so Klose. Indeed, during the reaction sulfur leaves the reactive molecule in a so-called "traceless" manner, meaning it is not present in the final products. 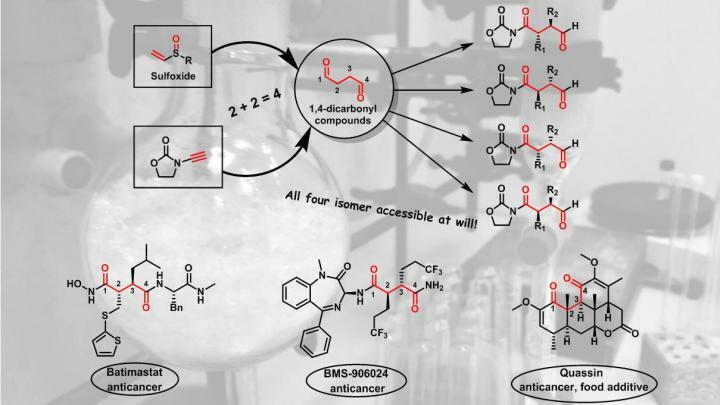 Not only is the sulfoxide partner critical in the reaction, the researchers have shown that by choosing the right starting sulfoxide each and every single one out of four possible isomers of the product can be obtained selectively. "Our sulfoxide reagents have two positions which can be changed: the sulfur itself and the two carbons that are connected to it. This gives us 4 possible combinations", explains Dainis Kaldre, former PostDoc at the Institute of Organic Chemistry and co-first author. "The great thing is, by changing between these 4 possible combinations we effectively 'fine-tune' the reaction into delivering selectively each and every one of the 4 configurations of the final product that are possible", says Kaldre. This makes the method extremely general and powerful. "The flexibility of our method can now be used to make a breathtaking amount of molecules that were not even thinkable before", explains Maulide. The Group has already shown this in the initial report in the renowned journal Science, whereby they demonstrate a simple way to make matrix metalloproteinase inhibitors. "There was no good way to make these compounds. In particular, it was very difficult to make a specific configuration in selective way; now, with our method, we can make any one out of the 4 possibilities, at will. ", enthuses Maulide. The reactive species with which the sulfoxides are combined are somewhat exotic intermediates called "vinyl cations". For doing research with such species, Maulide won a prestigious ERC Consolidator Grant of 2.0 million Euro. "It is remarkable, how basic research on 'exotic molecules' can so easily result in breakthroughs for society. This is a very welcome – and timely – reminder of the immense value that lies in investing in basic research", so Maulide concluding. Can population policy lessen future climate impacts?